States across America are beginning the process of digging their way out of record-breaking snowfall this morning after Winter Storm Jonas battered the nation’s East Coast on Saturday, wreaking havoc on millions and turning major cities into ghost towns. Almost all areas hit by the storm will get to enjoy above-freezing temperatures and sunlight today as the storm has headed out to sea, which should aid with clean-up in some states but in others lead to problems with flooding and ice once temperatures dip below freezing later in the evening. Ten states declared emergencies during the storm, which resulted in the cancellation of over 12,000 flights canceled across the country while stranding motorists in states for more than 24 hours in Kentucky and Pennsylvania. 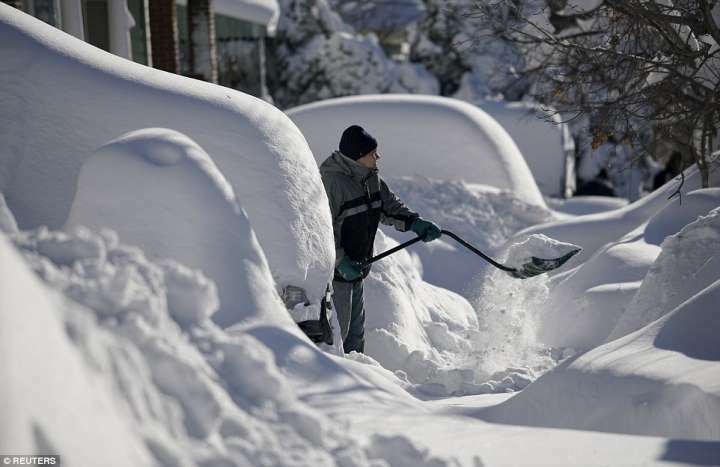 The death toll had reached 19 by early Sunday making it one of the most deadly snow storms in recent history, and that number grew to 21 by late morning as new reports began to come in and the clean-up process began on the East Coast. New York City, which came to a standstill by Saturday afternoon because of the hurricane-like winds and massive snowfall, reopened all subway lines and bus routes early Sunday morning while allowing cars back on the roads after Mayor Bill de Blasio announced a ban on all non-emergency vehicles, though many streets in the nation’s most populated city still remained buried under two feet of snow. It was the second biggest blizzard since 1869 for the Big Apple where 26.8inches of snow was reported in Central Park and a record snowfall in Baltimore where residents got 29 inches of the white stuff. Glengary, West Virginia, topped the charts for the East Coast blizzard with an astonishing 40 inches of snowfall. In Washington DC, monuments that would typically be busy with tourists are opening again on Sunday after standing vacant Saturday while mass transit in the capital is hoping to reopen by early afternoon after a complete shutdown. As for Jonas, the storm system is now heading across the Atlantic on 3,000 mile trip that is expected to make landfall later this week in the UK where it will once again showcase its violent storm force winds but couple that with heavy rain instead of snow.